Phoenix Restaurant is a “cha chaan teng” (tea restaurant) chain with two locations in Markham and one in Thornhill. Cha chaan teng’s are popular in Hong Kong where they opened as an option for the common masses to eat Western style food, which historically was only afforded to those who were rich. The menus are generally large and vary with Asian options (noodles in soup, chicken and rice) and Hong Kong-style western dishes (steak, baked rice & spaghetti). There are many tea restaurants across the GTA, each offering a la carte and set meals at affordable prices. At Phoenix I had one of their set dinners, the XO sauce stir fried udon with seafood ($11.99) which came with soup, a mini croissant and drink. To change the Hong Kong-style milk tea to cold, I added an additional $1.15 which as a percentage of the meal price is actually quite expensive. But, I find this aromatic, smooth and strong tea is best enjoyed cold. Made from black tea seeped for a long time and finished with simple syrup and condensed milk the tea is much richer and stronger than the regular orange pekoe. 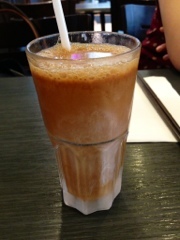 Phoenix did improve on it by serving the tea in a frosted glass and without ice so it stayed concentrated. For the soup, I chose the non-creamy borscht option. Unlike the original Ukrainian version which uses beetroot for the broth, the Hong Kong version is tomato and beef based. 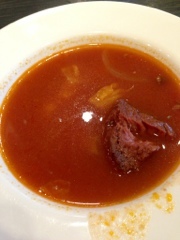 Phoenix’s soup is spicier than others and very flavourful. Rather than have a lot of small chopped up ingredients the chef left them in larger pieces so the soup ends up looking a bit plain and watery. It’s a bit disappointing that the regular cabbage, carrots and potatoes were missing as these vegetables add heartiness to the soup. The miniature croissants are much like the ones that can be found in grocery stores, but they are toasted with extra butter spread onto it. Luckily, they aren’t very big as the one small piece of bread must pack a big caloric punch! 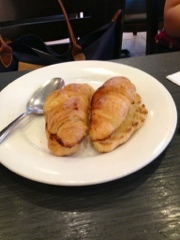 Normally, most tea houses offer a sweet Chinese egg bun, which I would have preferred to the oily croissant. As soon as the XO sauce stir fried udon was put in front of me I wanted to dig in. XO sauce is made from dried seafood, garlic and chili oil which gives the dish it’s added to a strong aromatic smell. A fairly large portion of the udon was mixed with shrimp, scallop and squid that were actually a decent size. 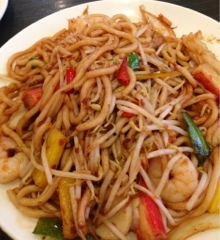 Overall, it was a delicious stir fried noodle dish. 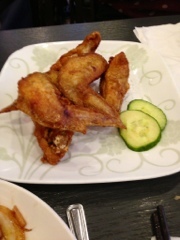 We also got an order of the fried chicken wings ($5.25) to share amongst the table. There were five to the order and very crispy and hot. They are your regular run of the mill non-coated and no sauce deep fried Chinese chicken wings. Cha chaan teng’s like Phoenix have been around for over a century now and are a great option for inexpensive meals with tons of options that can satisfy a wide variety of tastes. A popular choice with families and large groups, everyone can easily order the set courses and share. Moreover, food is served at lightening speeds so it’s also good if you’re looking for something quick.